BLACKSBURG, Va. — Citing a drop-off at in-game heckling, Virginia Tech students are now required to take a 4-credit course in endlessly mocking UVA football. Need the semi-perfect Christmas gift? Our 2019 calendars can be found in our Facebook shop and at Mongrel in Carytown (Richmond). The course will feature a number of lessons on important topics such as clever signage, hand motions, how to make that key-jingling thing even more annoying, and feigning superiority over an athletic program that clearly no longer cares about itself. 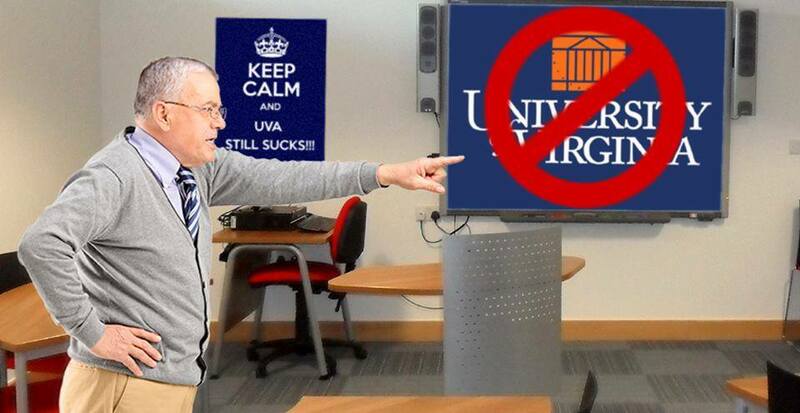 Professor Frank Shields suggested the class to the administration last yer after a particularly lackluster, post-Thanksgiving matchup where not one UVA fan retaliated against any heckling. Shields, who also served as a second-string backup waterboy during the 1999-2000 season, has made it his life’s mission to make Virginia Tech good at heckling again. Many students have commented that Shields’s course is remarkably difficult, as the only way to actually get an A is to be arrested for starting an altercation with a UVA fan after calling the Lawn a disappointment. This year’s matchup between the two teams will serve as the semester’s final exam. Shields requires that each student come up with three unique cheers apiece, to be shouted in an extreme state of inebriation directly into the ear canal of a neighboring UVA fan. The grade is based on grammatical correctness, overall creativity, and references to Tech’s winning streak over UVA. Shields noted that extra credit options were also available. For example, if the recipient of the heckling is a child between the ages of five and 12, an additional five points will be added to the student’s final grade. “I think my students are ready to blow them out of the water this year and make some UVA fans cry for more reasons than usual,” Shields stated.